Something Delightful : Under $50 Rust Dress + A Huge Sale! Under $50 Rust Dress + A Huge Sale! Hello friends and happy Wednesday! Last night we arrived in Highlands, NC. for a few days. Today is Jaycee's birthday and we love bringing her to Highlands. It's such a fun, pup friendly place and perfect for celebrating her bday. I can't believe my fur baby turns SEVEN today! I'm so excited for today's post, because I'm sharing both a really fun mommy and me look + the details to an amazing fall sale! It's a great opportunity to stock up on a bunch of fall staples that rarely ever go on sale. Keep scrolling down to see my picks from the sale. As for today's look, rust (or burnt orange) is one of my very favorite colors for fall. I simply can't get enough. Today I'm styling the most adorable rust swing dress for fall! In the front, it looks like a button up dress, and in the back it has the most adorable drop waist, pleated details. I couldn't say enough good things about this dress. It's absolutely precious and the perfect piece for fall. It's great for now with booties and also looks amazing paired with knee high boots once it cools off some. It also comes in black and is under $50. It is most definitely a loose fit, but I ordered my regular size (a XS) and love it. I also have to mention that my watch it on sale!! I love this piece so much. It sold out so quickly where I purchased it from. But not only did I find it in stock but also ON SALE! How precious is Madeline's little dress?! I love that her dress is the exact same color as mine. Her dress and top are actually a set for under $20! Her little scallop booties are also adorable. All I can say is, Target does it again! She was so funny when we snapped these photos. She said her bunny wanted to be in some of them. The way she is looking at her bunny in one of the photos above just melts my heart! I love how her sweet little personality shines through when she cares for her baby dolls and stuffed animals. Next up, I'm SO excited to share the details to an amazing sale that started today! Shopbop began their fall sale and it's SO good. This sale is a great opportunity to stock up on fall pieces and designer pieces that rarely go on sale. You can save 20% off any order or 25% off orders over $500 with the code "STOCKUP18". Above I'm featuring all of my picks. The sale ends on Saturday, so hurry before all the good stuff sells out. I also have to mention that my favorite pair of designer sunglasses are included in the sale. And also my Clare V. Straw totes that I adore. Hunter boots are also included in the sale and so many more pieces that rarely go on sale. I shopped the sale last night and purchased four really great pieces. I picked up these slouchy booties. I'm obsessed with these! 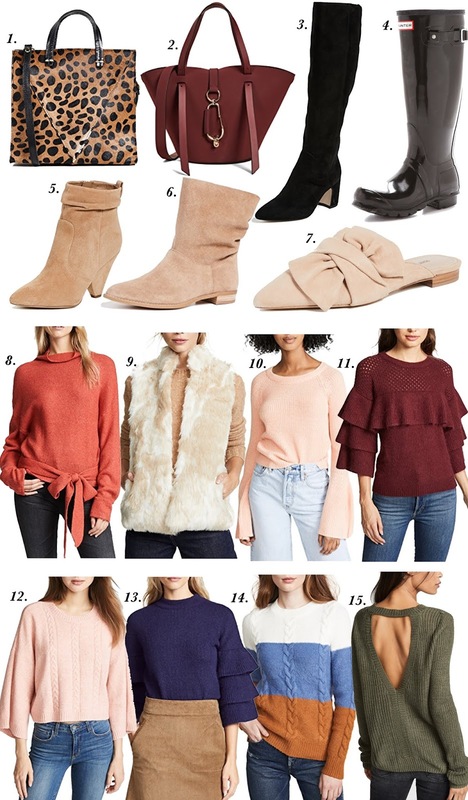 I love a good slouchy boot but had never seen a pair of slouchy booties before. They also come in black. The second item I picked up are these black knee high boots. I wore mine out last year and needed a new pair. These remind me of a pair I wanted from the Nordstrom Anniversary Sale but never could get due to my size selling out. But now that these are on sale, I grabbed them up! I also purchased this faux for vest. I LOVE the colors. And lastly, this ruffle sleeve sweater. How gorgeous is this color?! This is a piece I wouldn't have normally purchased due to it being $100 (I normally keep my clothing under $100) but with it being on sale, I was able to get it for under $100. I'm also eyeing this bag! It's a splurge, but I've been wanting it for some time. This pumpkin/rust shade looks perfect on both you & Madeline! Love the cut of the dress on you as well-super flattering!